Rushed review of K-12 education system misguided | Where's the funding? 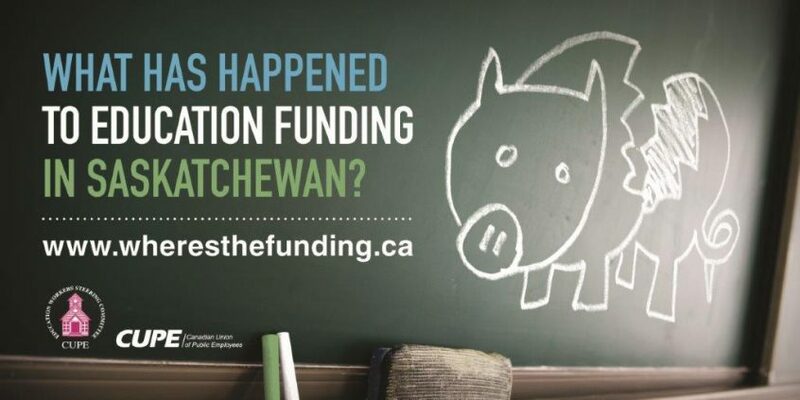 REGINA- The announcement of a rushed one-month review of Saskatchewan’s K – 12 education system is another misguided step in the provincial government’s so-called transformational change agenda, according to CUPE. “We don’t need a rushed review looking for pocket change because of the provincial government’s growing deficit. We need education support workers and resources for our children to receive the quality education they deserve,” said Tom Graham, President of CUPE Saskatchewan. Education Minister Don Morgan announced that the review will look to reduce and amalgamate school divisions and may even fundamentally remove the democratic system of elected school board trustees in favour of appointees. School divisions, receiving the bulk of their funding from provincial operating grants, have already felt a squeeze in finances with some divisions resorting to significant layoffs and reduced hours of education support workers. Moreover, some school divisions have been using reserve funds to make up for a funding shortfall and to offset cuts, which the Education Minister has made clear will come to an end. CUPE is concerned the K-12 education system review will only further the cuts to frontline support for students.